Last January, on the heels of a successful popular revolution in Tunisia, Egyptians decided that they wanted to govern themselves as well. This led to the eventual overthrow of the 30-year Mubarak regime. Since then, the Egyptian path to democracy has been challenged, with the country’s military elite largely filling the empty spaces of power. But while this political transition stumbles forward uncertainly, with the forces of reaction threatening to nip progress towards democracy in the bud, another less political threat looms. The health of the Nile Delta. A combination of factors over time, including sea level rise, the over-extraction of water from aquifers, and the sharing of Nile waters with neighboring states, are leaving the Nile Delta in a precarious situation. On a global scale, the IPCC predicts that sea levels will rise 0.59 centimeters by 2100. Scientists in Egypt are currently collecting data on sea level rise along the country’s northern coast, and are very concerned about the local impacts of the results. The Delta is, by nature, low lying. The problem for Egypt is that the Delta is also heavily populated (the vast majority of its population lives there), playing host to many of its major cities. These cities include Alexandria, Damietta, Rashid and Port Said, which could all be inundated with a mere 0.5 centimeter rise in sea level. 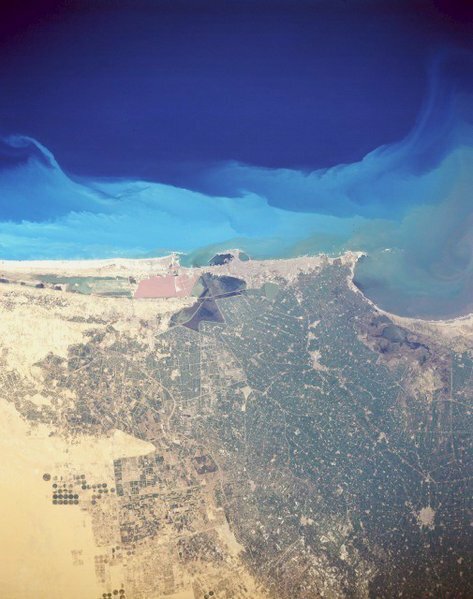 On top of this, Egypt’s delta aquifers continue to be permeated by salt water, and the problem is getting worse. This is bad news for Egyptian agriculture, fisheries and industrial centers along the coast. The Nile Delta and Mediterranean coast is responsible for at least 30-40% of the country’s total agricultural production, which could be devastated by increases in salt water intrusion. Furthermore, 30% of Egypt’s labor force works in the agriculture sector, mostly in the Nile Delta. On fisheries, according to UNEP, a third of Egypt’s fish catches are made in the Delta lagoons of Idku, Burullus and Manzala, which would all be negatively impacted by salination. Other industries dependent on major port cities like Alexandria also stand to suffer. In all, the World Bank estimates that these Low Elevation Coastal Zones (LECZ) are responsible for 15% of Egypt’s GDP. The fragile political situation in Egypt could obviously do without a looming environmental and economic problem of this magnitude. Democratic transitions do best in an environment of general economic stability. However, all of these problems existed well before the revolution. Reports from the UN and the World Bank, as well as acknowledgments by Egyptian officials of the importance of addressing rising sea levels and sinking groundwater levels, abounded. But there was also a general understanding that the issue was difficult to address because of the lack of available local data, and a balkanized governance situation with numerous overlapping departments and authorities, and serious gaps in capacity. But while the immediate concerns of developing a functioning and representative government likely outweigh attention to the granularities of governing fisheries, agriculture, and ports, the political transition in Egypt also presents a real opportunity to fix the governance issues that made tackling these problem so difficult under the previous regime. Progress on addressing the problem of sea level rise, and the Nile Delta’s health, could enhance both the legitimacy and resiliency of a new Egyptian government. The shifting political sands, and the shifting sands of the Nile Delta, need not move in opposite directions. By Francesco Femia & Caitlin Werrell in agriculture, Arab Spring, climate change, Egypt, food security, IPCC, military, population, salination, UNEP, United Nations, World Bank on January 16, 2012 . Excellent work, excellent article ! Let me write a few comments on legal and social context. Forecasts for climate change by the 2,000 scientists on the United Nations Intergovernmental Panel on Climate Change (IPCC) project a rise in the global average surface temperature by 1.4 to 5.8°C from 1990 to 2100. This will result in a global mean sea level rise by an average of 5 mm per year over the next 100 years. Consequently, human-induced climate change will have ?deleterious effects? on ecosystems, socio-economic systems and human welfare.At the moment, especially high risks associated with the rise of the oceans are having a particular impact on the two archipelagic states of Western Polynesia: Tuvalu and Kiribati. According to UN forecasts, they may be completely inundated by the rising waters of the Pacific by 2050.According to the vast majority of scientific investigations, warming waters and the melting of polar and high-elevation ice worldwide will steadily raise sea levels. This will likely drive people off islands first by spoiling the fresh groundwater, which will kill most land plants and leave no potable water for humans and their livestock. Low-lying island states like Kiribati, Tuvalu, the Marshall Islands and the Maldives are the most prominent nations threatened in this way.“The biggest challenge is to preserve their nationality without a territory,” said Bogumil Terminski from Geneva. The best solution is continue to recognize deterritorialized states as a normal states in public international law. The case of Kiribati and other small island states is a particularly clear call to action for more secure countries to respond to the situations facing these ‘most vulnerable nations’, as climate change increasingly impacts upon their lives. Thank you for this article; it provides me a very good concept from the truth. I will keep this in mind the next time I am in Egypt.